1. All of the lessons deal with several common themes: (a) The God Who was first revealed to the descendants of Abraham and Sarah, the Jews, is the God of all people. (b) God desires relationships with people of all backgrounds. God wills to create and respond to faith in all peoples. 2. It's interesting to note that these themes are seen in both the Old Testament and the New Testament readings, that is, in Isaiah and the Psalm in the first case and in Romans and Matthew in the latter. In the Old Testament lessons, the universality of God's dominion and God's command that foreigners be treated justly underscore this theme. In the New Testament lesson, Paul's letter to the first-century church at Rome, composed largely of Gentiles, reminds the Christians there that God's grace toward them doesn't mean that God has taken grace away from the Jews. The lesson from Matthew's Gospel, a document thought to be addressed primarily to Jewish Christians, emphasizes that from the beginning, though Jesus' earthly ministry was directed to "the lost sheep of the house of Israel," the grace of God was available to all with faith in the God revealed ultimately and definitively in Jesus. 1. I'm going to preach on the Gospel lesson this week. My choice is to focus only on Matthew 15:21-28 and to forgo the optional 15:10-20. But because understanding a specific passage of Scripture is helped by considering the context in which it appears, I'll briefly touch on what happens in those preceding verses. 2. All of Matthew 15 deals with the question of "ritual purity." Who is pure in God's eyes? Who is impure, defiled? The Pharisees weren't completely off-base in their concern with this issue. The Old Testament did enumerate lists of ritual laws meant to afford God's people the ability to express gratitude for all of God's blessings. But for many in their camp, these laws weren't seen as the means of expressing gratitude, but the means by which they could say who was in with God and who wasn't. For them, it was clear that the only people who were clean and part of the club were Jews who kept not only Old Testament laws, but also human traditions. Lost in all of this was the role of faith. By faith in God's promises and not be the performance of the stipulations of ritual laws, Abraham had been declared righteous, right with God. By faith, centuries later, David had repented for his sins and trusted in God's mercy, knowing that God doesn't honor ritual observance devoid of trust. 3. Another great theme of both Matthew 14 and 15 is faith. In Matthew 14:31, Jesus chastises Peter, who began to sink after initially walking on the water, for being "of little faith." In this passage, a foreign woman is extolled by Jesus for having "great faith." 21Jesus left that place and went away to the district of Tyre and Sidon. (1) Jesus is apparently getting away from the Pharisees whose strident opposition of Him is increasing. They may have been emboldened in going after Jesus after John the Baptist, someone else they found pesky, had been executed. (2) This is one of only two times in the Gospels that Jesus is said to have traveled outside of His homeland. 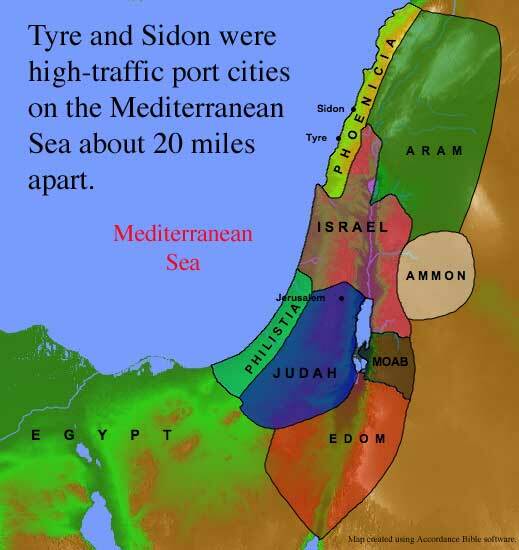 For more on Tyre and Sidon, go here. They're located north of Judea, where Jesus lived. (1) In recounting this incident, Mark calls the woman, Syrophoenician, the designation used in Jesus' time. Matthew uses the more ancient term, Canaanite. The Canaanites were the enemies of God's people in ancient times. The Canaanites were, in the Old Testament, thought to be cursed and to be annihilated. Being a foreigner--a Gentile--would have been one among those "outside" things that would have caused the Pharisees to dismiss this woman out of hand. She was ritually unpure, below both God and God's people. Matthew didn't call her a Canaanite by accident. He wanted to demonstrate that God's grace can reach anyone and that faith in God can be exhibited by anyone. (2) The woman uses a loaded word herself. The designation, "Son of David" means that she understands Jesus to be Israel's long-promised Messiah, Christ. This is something that most who know of Jesus within His own country don't see or confess. (3) The woman claims no special privileges. Nor does she claim to deserve what she asks of Jesus. "Have mercy on me!" she cries. (1) Many are inclined to interpret Jesus' initial unresponsiveness to the woman as callousness. Others think that Jesus is testing the woman. But based on what happens subsequently, I think that if Jesus is testing anybody, it's the disciples. He's certainly going to teach them an important lesson momentarily. (2) Brian Stoffregen points out that the word translated here as shouting is, in the original Greek of the New Testament, krazo. It means, basically, making an annoying noise. This woman is bugging the disciples. (I can't help but think of Bono on the live concert LP by U2, The Rattle and the Hum. He's singing the band's anti-apartheid song, Silver and Gold, when he says, "Am I bugging you? I don't mean to bug you.") Interestingly, this is the same word used in Matthew 14:26, where these same disciples cried out--annoyingly, maybe--in fear during the Galilean storm on seeing Jesus walking on the water. The difference, of course, is that the foreign woman cries out in faith, while they cried out in blind fear. (1) N.T. Wright points out that this is Jesus' mission. He is the Messiah of Israel. His mission was to the lost sheep, the spiritually wandering defectors, of God's people. He will later commission His followers to expand that mission to Jerusalem, Judea, Samaria, and the world. But before the world can be called, the Messiah must do His ministry and call Israel to faith. Had Jesus embraced any other ministry, He would have been faithless and rendered God's Old Testament prophecies about the Messiah lies. Still, in the incident as it's about to unfold, Jesus always was open to foreigners with faith and in that openness, foreshadowed the international ministry of His Church. (1) Once more, the woman isn't claiming to be a special case. She just needs help. Her confidence isn't in herself, but in the One from Whom she asks for help. (1) Dogs was a derogatory term used of foreigners. But Jesus uses a word that might more appropriately be translated as puppy or pet. This hints at Jesus' intentions. He and the woman are now engaged in a playful dialog, making clear that Jesus will grant this woman's request. (1) The woman agrees with Jesus. It isn't fair for the dogs to get the children's food. The Gospel belongs first and foremost, to the children of Israel. But, the woman says, playing along with Jesus' softened image of foreigners, "even the puppies get crumbs from the lord's dinner." The woman acknowledges that she has no right to the main course. After all, she's no descendant of Abraham. She doesn't keep the ritual laws. She doesn't worship in synagogue or the Temple in Jerusalem. She's simply asking that a few morsels of God's abundant grace, undeserved as grace always is, will come to her daughter. By now, the woman seems to understand that she and her daughter have become object lessons used by Jesus to convey something very important to His disciples. 28Then Jesus answered her, “Woman, great is your faith! Let it be done for you as you wish.” And her daughter was healed instantly. (1) Jesus extols the woman's great faith. Stoffregen points out that this is the second time that Jesus has mentioned a person's great faith. As mentioned above, it contrasts to the little faith exhibited by the disciples in the boat in Matthew 14. (2) Jesus didn't change His mission after this encounter. He continues to minister to the "lost sheep of the house of Israel." But we do see a preview of coming attractions in this incident. On the first Pentecost, fifty days after Jesus' resurrection, when the Holy Spirit gave birth to the Church, Peter alluded to several passages from the Old Testament when he said, "Everyone who calls on the Name of the Lord shall be saved" (Acts 2:21, see also Psalm 145:18). Jesus shows that to be true here. How Partisan Should a Partisan Be Expected to Be? Two Cuyahoga County mayors have been suspended from the Democratic Party executive committee there because they've joined other mayors in endorsing a Republican candidate for county commissioner. The first two US presidents--George Washington and John Adams--fiercely resisted and condemned party spirit, something they saw as contrary to patriotism, loyalty to country. Adams, ever independent and rarely tactful, was deemed irrelevant by the two parties which emerged during his presidency: the Federalists, under the leadership of Alexander Hamilton, and the Republicans (later the Democrats), led by Jefferson. The rise of political parties was probably to be expected. And, I feel, we've been blessed in this country to have only two major parties, big tents that have, except in the years immediately before and for some time after the Civil War, cut across regional lines. The parties have, through much of our history, been places that could debate and subsume new notions advanced within and outside their ranks, and that have helped knit the country together. Through them, we've avoided the madness of Europe's multiparty chaos and we've become more of a United States of America. Parties afford those who share beliefs in a broad set of political principles and ideas to work together. That's good, in my book. But should partisan affiliation be a strait jacket? If you're a Democratic or Republican office holder or candidate, should you feel bound to support every candidate or office holder who wears the same label, even if you think that person is incompetent, dishonest, or unqualified? Or, should you feel constrained from endorsing a candidate you think is clearly better, even when that person is from the other party? I know nothing about the particulars of the Cuyahoga County case. But it does seem emblematic of the sort of thinking that has led to gridlock in Washington and red-and-blue isolation around the country. It's nuts! On a recent edition of The News Hour on PBS, conservative columnist David Brooks lamented the depressing partisan kabuki dance in which seemingly intelligent members of Congress engage. He described a large class of Washington politicians as being reasonable in private, willing even to admit where members of the opposition party might be right, but irrationally partisan once they appear before the media and constituent groups. At weekly partisan gatherings, these members of Congress who get paid base salaries of $169,300 per year, presumably to apply their best thinking to their jobs, are given that week's partisan talking points. Any number of pundits, hacks, political functionaries, and bloggers readily mimic these "points" so that, all across the country, on TV, radio, and the Internet, the rest of us are subjected not to debates, but a kind of mindless automaton-speak. This nuttiness permeates all the way down to the local level, making our politics less about getting things done than getting and keeping power as a game...with innumerable perks. Two local mayors endorsed a candidate for county commissioner from another party. They may be wrong in their judgment. Their motives may even be wrong. But how much partisanship is too much? Democracy requires grownups. How much of this partisan childishness can the US political system take? John McCain and Barack Obama would do us all a favor by being grownups this year, moving beyond partisan cliches even while upholding their own basic principles, evidencing a willingness to compromise, and owning their flip-flops when they result from mature consideration. Most Americans, I think, would welcome a mature approach to our politics. We might learn from their examples should Obama and McCain take this approach. So far, they've failed us all. The Real Symbol of the Beijing Olympics? A commenter on this post sent a link to this logo. Riffing off of a series by our mutual friend, Mark Roberts, blogger John Schroeder has some thoughts on what constitutes true church growth. as selected by theologian Ben Witherington. It's totally subjective, but worth a look. I remember the controversy that surrounded the installation of the Picasso sculpture in 1967. I went to Chicago for a visit with my aunt, uncle, and cousins, who lived in nearby DuPage County, just two years later. It was the weirdest and, to my fifteen year old mind, most wonderful piece of public art I'd ever seen. Nine years after the Picasso was installed in Daley Plaza, we had a similar controversy over a piece of public sculpture in my hometown of Columbus. 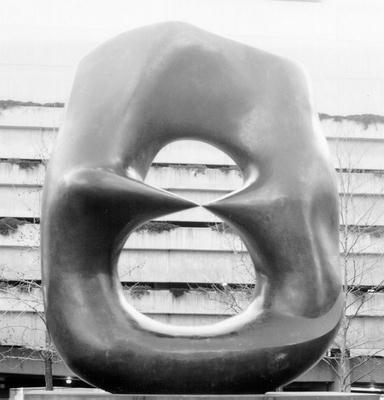 A group of local patrons made it possible for the Columbus Museum of Art to purchase what I believe was then one of two renderings of Henry Moore's 'Large Oval with Points.' (A perfunctory search of the web indicates that there are a few more of them around today.) The site chosen was a parcel of land, once the location of the old Franklin County Court House, then being developed into a small urban green space. What do you think, does art always have to represent something? Or is it enough that it either reflects an artist's passion or engenders passion in us? "To be known is to be loved." I love that! Thanks to Bosco Peters for leading me to this video. Visit his site. To tell you the truth, I lost interest in the Olympics back around the time of the first "Dream Team." It was then that the Olympics gave up all pretense of being for "amateurs." I know that there were paid athletes even then. Still, there was some hint of amateurism. Occasionally, true amateurs would perform well in an Olympic event. And amateurism was helf up as an ideal. But now everything about the Olympics, from the opening ceremonies to the sponsorships and beyond have been "monetized." I just can't get into it. My wife has said that she would be watching the Olympics this year were it not for there being in China. She, like me, abhors the Chinese government's abysmal human rights record, among other objectionable things. Are my wife and I simply being contrarians? What makes you watch if you do? What stops you from watching if you don't? I'll be interested in your comments. I think of Joe’s dad every time I consider the passage from 1 Kings that makes up our first lesson for this morning. Elijah was the greatest of all the Old Testament prophets. But when we meet up with Elijah in our first lesson for today, he is terrified and running for his life, concerned that he might be killed at any time. Elijah’s feelings are understandable. He may be paranoid. But there really are people coming after him. A little background is in order. When we encounter Elijah today, he’s just coming from a gold-medal caliber encounter with the prophets of the false godlets called Baal. Baal worship had been brought to Israel by Jezebel, the wife of King Ahab. The marriage of Ahab and Jezebel was one of those alliance-forging unions royal families often undertook. It made Israel more powerful and wealthy than it had been in one-hundred years. But it also made the people of Israel spiritually complacent. When life is tough, you turn to God. But when you’re on easy street, you start to erect little gods you can control and have do your bidding. Israel was so well off during Ahab’s reign, that the people abandoned God and became enrapt with the fad of Baal worship. Now, the people of Israel, as God reminds Elijah in our lesson, didn’t completely abandon God. But it seems that most tried, as Elijah put it, to limp along with two ways of religious life—one faithful to the God Who had delivered their ancestors from slavery in Egypt, taken them as His people, loved and forgiven them, the other bent on following the pliant gods of convenience favored by the beautiful people. But that won’t work, Elijah told them. “I the Lord am a jealous God…You shall have no other gods,” God had told His people in His first covenant with them. God hadn’t revoked that covenant. (God still hasn’t revoked it.) In spite of that, Jezebel hired Baal priests, built Baal altars on the highest hills, and even erected a Baal temple. All of this was polluting Israel’s life, the people walking more and more away from God. God had enough! He told Elijah to invite 450 Baal prophets to Mount Carmel where it could be demonstrated who the real God was. The God of Israel--the God you and I know through Jesus Christ--won. The prophets of Baal were executed. It was a moment of triumph for Elijah. But Jezebel sent a message to him. "You'll be as dead as the prophets of Baal soon," she warned. Elijah was afraid. So, Elijah ran! He only stopped long enough to ask God to take his life. “I’m a goner, God,” he said in so many words, “Just take me now.” But God gave Elijah a good meal and told Elijah to be on his way. "You've got a trip ahead of you and you'll need your strength." After Elijah ate, he took a forty-day hike that ended in a cave cleft in Mount Horeb, one of the places where, five-hundred years before, God met Moses. Now, there are three things I want to point out about the encounter that Elijah had with God in that cave, all of which I hope will help you when, like Elijah you feel life is closing in on you. Your enemy doesn’t have to be a ruler who wants you dead. It may be disease, the loss of a loved one or a job, the encroachment of age, the ordinariness of life, or a fear. Whatever your cave may be, pay heed to Elijah’s experience at Mount Horeb. Lesson #1: God can meet you in your cave. True story. Dena, a friend of Ann’s and mine, was abandoned by her husband. When that happened, many of her so-called friends abandoned her too. It wasn’t that they agreed with what Dena’s husband did. It was that her sadness was an impediment to their good times. But, Lisa, another of Dena’s friends, was there for Dena. Dena’s motives were simple. She wanted to extend the love and strength of God that she knew belonged to her as a follower of Christ. Lisa knew that through her, God could meet Dena in her cave. It’s no accident that in the months after Lisa spent time with her, Dena began going to church. Today, happily remarried for nearly twenty years, Dena is deeply involved in her church, where, among other things, she writes original Sunday School curriculum and participates in mission trips to Latin America. It was true for Elijah. It was true for Dena. God can meet you in your cave, too. Lesson #2: God wants you to be clear about your purpose. When his wife died at far too young an age, Roger, a man I met years ago, wasn’t sure what to do. Every time you turned around, it seemed, Roger was weekending at some remote place, attending a conference with some new guru, or quickly throwing himself into a new hobby which he dropped just as quickly. Without his wife, Roger felt that his life had no purpose. For a time Elijah had been clear about his purpose. At least it had been clear to him. He was to promote a contest with the prophets of Baal at Mount Carmel. After God had used him to prove the falsehood of the Baal religion, he would run the Baal worshipers out of the country and God would once more be universally worshiped. The contest went fine. But, contrary to his expectations, Elijah’s efforts weren’t met with unvarnished success. Instead, the queen put a contract out on his life! So, Elijah ran and ran until he came to that cave. You can almost hear the whine in Elijah’s voice as he totally misses God’s implicit question and responds both times by saying, “I’ve been faithful in following You, God. I’m the only one. And what do I get for being such a great guy? People want to kill me.” You see, Elijah thought his purpose had been taken away from him. But after each of Elijah’s lame answers, God shows him what Elijah’s real purpose is. It’s our purpose too, whether life is going well or not. Purpose 2: To fulfill the simple duties God gives us to do. In the cave, God gave Elijah three simple tasks. Most of what God calls us to do involves simple tasks. God will entrust few of us with missions like curing cancer, writing the Constitution, or preaching the Gospel in faraway places. (And it should be pointed out, even the people entrusted with such mega-tasks will also be called to daily faithfulness.) Fulfilling God’s purpose for our lives involves doing our duties as children, spouses, parents, friends, employees, and employers. That means loving God and loving neighbor in all of our relationships. Lesson #3: God wants to find you. God wants to come to you and be with you, wherever you are in your life. The other night, our family was recalling a memorable Christmas Eve. Phil, now twenty-six, was three years old. My mother-in-law gave a toy fire helmet to him. It had a loud siren and a flashing red light. Phil strapped it on and went charging around our house before the start of the first Christmas Eve service we would experience at our first parish. How many times are we like that with God? God wants to help us. God wants to assure us that we are loved and cared for. But we’re too busy being busy, or rebellious, or trying to solve our own problems to let God give us that assurance. In Psalm 46:10, God says, “Be still, and know that I am God.” Similarly, in that cave at Mount Horeb, God told Elijah to go out onto the mountain so that he could experience God coming to him. There came a fierce wind, but Elijah didn’t sense God there. Then there was an earthquake and then fire. But Elijah didn’t sense God in them either. Then, there was sheer silence. In the silence, in the stillness, Elijah sensed God’s presence. The same can be true for us. We may experience God in thundering ways or quiet, but however we experience God, we must be still long enough to let God come to us. In the early years of my life, I went to a church where people thought nothing was happening if someone wasn’t talking or singing or making noise. And there’s a time for all of those things. "Make a joyful noise to the Lord!" the Bible tells us. But this notion of constant noise-making influenced how I prayed even years later. I thought that if I wasn’t yammering, I wasn’t praying. Then, I ran into the Biblical notion that prayer is just as much about letting God speak to us as it is about our speaking to God. It's why Jesus often would go to private places to be with the Father. I haven’t had that experience often; God is the one who decides when and where He will do such things. But, as was true for Elijah, you can bet that God’s timing will be perfect. God wants to find you. If you came here this morning hounded by fear or sadness or the reality of your own sins, I invite you to use this sanctuary right now as your cave, a place of refuge where God can meet you, as He met Elijah. The God Who fully disclosed Himself to you and me in Jesus Christ wants Elijah’s lessons and experiences to be ours as well. God can meet you in your cave. God can give you purpose. And whenever you feel lost, God can find you. Let God do these things for you this morning.